The most important phase of the game quickly became the battle between Bayern’s possession game and United’s defensive block. Bayern began in their typical 4-3-3 formation with Gnabry playing the central striker role, Muller and Thiago as the attacking midfielders, Martinez as the lone defensive midfielder, Ribery and Robben on the wings, Alaba and Kimmich in the fullback positions, and Hummels and Sule as the central defenders. Muller behaved more like a second striker, often in close support of Gnabry, while Thiago behaved more like a deep-lying playmaker from the left defensive halfspace. Thiago was able to drop outside of the United 4-1-4-1 block and move inside diagonally from the left defensive halfspace to play long diagonals or sharp passes into the central strikers for combinations. Due to Mourinho’s team preferring to keep their positions in midfield, there were minimal pressing runs out of the midfield in order to attempt to win the ball back. Rather, they maintained their 4-1-4-1 defensive block and shifted passively towards the wings as the ball was switched. When the ball would be played inside their defensive block they naturally showed more aggression – but because they had only Rashford in a higher position to press, Bayern easily overloaded the deeper zones which allowed them to more circulate the ball with more time and space. Due to the build-up players having more time and space, frequent long switches with a threat of an immediate cross or passes into depth were played. This forced United’s defense further and further back toward their own box. Bayern then assumed full control of the match as United were forced to defend their box as the German Champions constantly threatened into attacks into their penalty box while making sure to maintain balanced enough positions to control counterattacks. On each side of the field, there was a large amount of fluidity. The triangle of Thiago, Alaba, and Ribery on the left wing behaved slightly differently than the triangle of Muller, Kimmich, and Robben on the right wing. Thiago most often occupied the defensive halfspace as mentioned earlier, while Ribery alternated between a wide position on the wing and a narrow position in the offensive halfspace. Based upon the movement of these two, Alaba would fill the resulting “open space” from the 3 choices of offensive halfspace, defensive halfspace, and wing. Bayern’s system in possession against the passive 4-1-4-1. Triangles on the wings decide between 3 zones and base triangle outplaying the opponent striker. The order of decision making seemed to begin with the highest player – meaning the winger. If Ribery decided on his position, then Thiago could decide which positions are possible for him, and finally, Alaba would fill the last resulting spot. This was a mechanism visible with the team during their time with Pep Guardiola, especially during the earlier seasons – later on in his tenure, they became more strict in their positioning and pattern of movements. On the right wing, Muller had slightly different behavior than his attacking midfield partner Thiago. Not only would he alternated between a second striker position closer to Gnabry and a deeper position in the defensive halfspace, he would also switch positions with Robben and move out onto the right wing. In comparison, Thiago would never switch with Ribery and Alaba to move out onto the left wing. This added another wrinkle in the fluid positioning of the triangle on Bayern’s right wing. Due to the high variability and read-and-react decision-making of each triangle on the wing, it was difficult for the United defenders to predict the movements and decisions of the Bayern attackers, making it far more difficult to defend. On the right side, the most frequent variation was with Kimmich in the defensive halfspace as a false fullback, Muller in the inside striker position, and Robben wide on the wing looking to receive fast switch passes to begin direct dribbling attacks. If Robben felt he wanted to move inside closer to the goal to receive the ball, Muller would simply move out to the right wing while Kimmich maintains his position. It was interesting to see Muller drop into the defensive halfspace at times too, as this is more of a move for players who like to have the ball on their feet, making decisions for the team and circulating the ball. Naturally, when he was positioned there, Robben and Kimmich alternated between the wing and offensive halfspace positions. Because Rashford was on him on in a central position against the 2 central defenders and Martinez, the defensive midfielder pulled the typical move when a build-up triangle is facing 1 triangle by moving off to one side (most often the right side) which allowed Hummels (and later Boateng) in the left central defender position to dribble forward and attack the low block. This turned the 2-1 triangle into a 1-2 triangle with Martinez and Hummels on the sides. From this base of bringing the ball forward without pressure, they would look to play between the lines or into the box directly. As the central defender brought the ball forward without pressure, this meant that Thiago and Kimmich (the most frequent deep players) could also move higher between the lines in order to create a massive offensive presence behind the opponent midfield which would be difficult for the United defensive line to handle. It would mean the 2 attacking midfielders, the 2 wingers, the central striker, and the two fullbacks were all high and between the lines. In this case, there would be a player on the wing, 2 in the halfspace (one close to the striker, one close to the winger) and the 1 central striker in a relatively even spacing. The dribbling forward triggered movements from the offensive players, with some running behind the United defense and some checking toward the ball at the same time – making it more difficult to decide where to move as a defender. Using this system in possession, Bayern played very fast switches between the wings, looked for combinations with their triangles on the wings to break through and cross, passed inside toward the central strikers for combinations in the middle, and passed behind the defense with diagonal chipped passes (Boateng to Robben offside goal) – all while relatively consistently occupying stable defensive positions to dominate the counter-pressing phase. It was an impressive display on how to attack a passive low block. When United was capable of maintaining possession, which was made difficult to a low and passive defense being consistently pressure by Bayern, they had some interesting movements. Mata as the right winger moved inside into a central attacking midfielder role while Herrera and Fred acted as the right and left central midfielders respectively. Pereira occupied the sole defensive midfielder role. Both fullbacks pushed higher up the wings while Sanchez moved inside from the left wing into his near halfspace, at times positioning like a second striker with Rashford. Rashford moved frequently out toward the right side of the field which was left vacant by Mata, ultimately created a 4-diamond-2-esque structure while in possession, which is quite common for Mourinho teams. Due to Bayern’s narrow positioning, the ball was often forced out onto the wings where Bayern pressed aggressively. They begin in a 4-1-4-1 formation out of possession as United did, but it was far more aggressive and focused on pressing movements rather than covering movements when compared to the more passive United block. Bayern’s pressing in the 4-1-4-1. Striker forces the ball one way and the rest of the team mark tightly – playing into Bayern’s dominance in physical one on one duels. This made it more difficult for United to progress higher up the field as Bayern would begin their pressing runs when the ball was passed to the wings, and with each pass on the wing they would press more and more aggressively – and interesting moment in the match is when United was playing the ball down the right wing, Robben timed the passes and came all the way across the field into the central attacking midfielder space to cover the center, and as the ball was passed back he ran forward to press the back line. 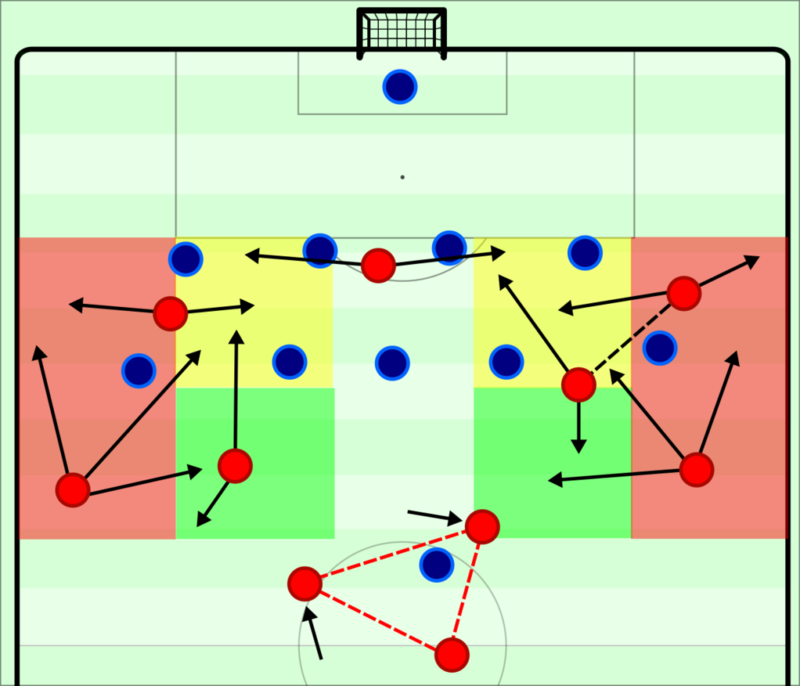 It is apparent that Kovac has worked with the team on having an initially compact and organized defensive block, and then looking for triggers to start sending out pressing runs toward the ball as the rest of the team shifts toward the ball to compact the space and cover the pressing players. The idea behind Bayern’s pressing was to have the central striker run out toward the central defenders and force the ball one direction toward the wing. At the same time, the attacking midfielders of Bayern would move onto the two deepest and closest central midfielders of United (Fred tended to position deeper than Herrera, at times making it look like a 4-2-3-1 formation). The back line would mark very tightly and forward options for United while Martinez came across to the side of the ball and covered the halfspace. This allowed Bayern to create constant pressing opportunities – forcing United into frequent long high balls to attempt and progress into the Bayern half. Ultimately, this proved to be an inefficient method of progression against the German team as they dominated the aerial duels and 2nd balls. Nevertheless, United did well to counterpress in the situations when they were able to push Bayern back into their half and showed their dominance and athleticism in the back line when covering counter-attacks. The preference of Mourinho to use more passive deeper blocks will make it difficult to control matches against top teams, as well as launch counter-attacks. When in possession their positioning, attacking, and counterpressing is at a high level – it is just about creating opportunities to get into the opposition half and counterattack more often from their passive defending. In England, they will mostly encounter teams who use long high passes and have worse pressing – meaning their compact low block will be useful for dominating long passes and 2nd balls, and that they will get far more opportunities to attack the opponent and pin them in their half during the league season. As the game entered the later stages, many substitutions were made by both teams – and both teams became slightly less clean in their actions, though Bayern still remained largely in control. United began to press more often, but it was not at a high enough level to bother Bayern, as the German Champions continued to create chances while circulating the ball in the opponent half and counterpressing. In the end, the winning goal was scored from a corner – but there were very positive signs from Bayern. They looked to press immediately when they didn’t have the ball and were also able to have a dominating possession game with constant threatening of the opponent box. There were traces of the team which played under Guardiola, but with more fluidity and freedom under Kovac. It will be highly interesting to see how Bayern do in the upcoming Bundesliga season.